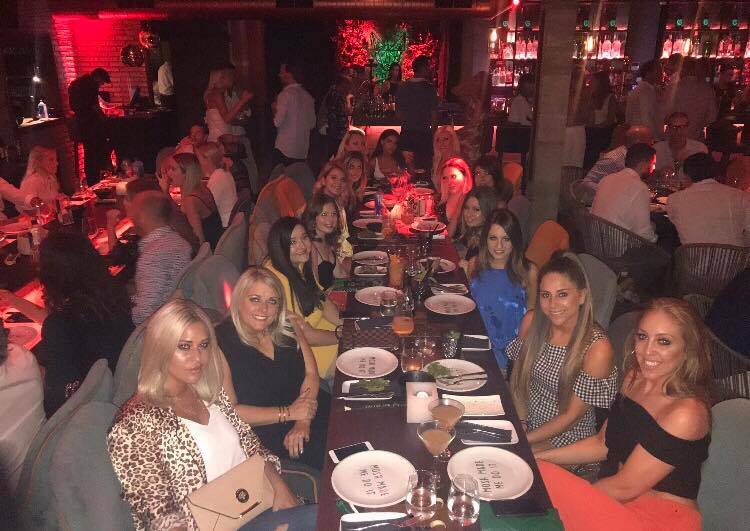 Marbella Hen Party- the perfect girls weekend away! My Marbella go to guide! You know when you have been planning something for a year and hope it’s going to be as good as you have been dreaming about.. but then it turns out even BETTER, well that sums up my sisters hen! 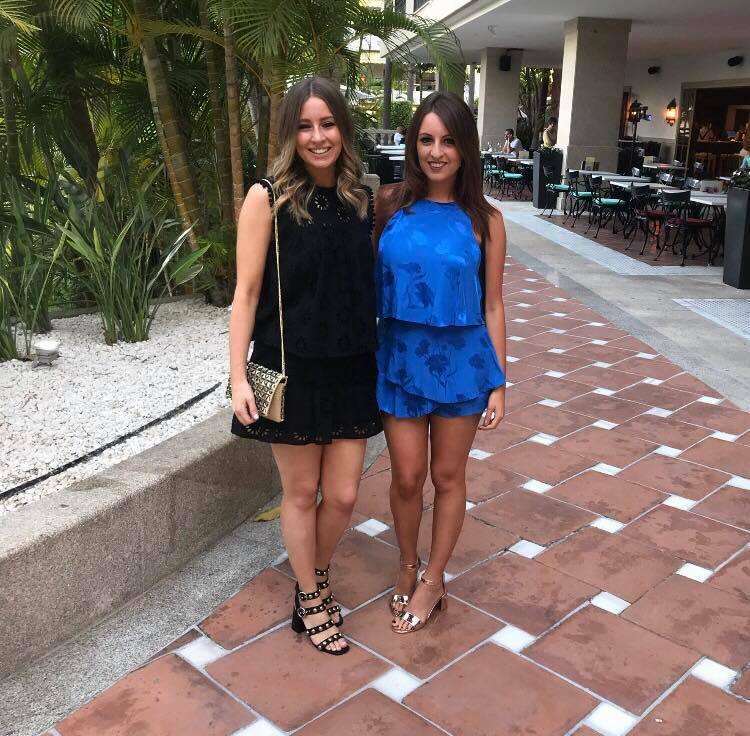 We went to sunny Marbella for three days and we laughed until we cried and danced on tables living our best life. It started off with 15 very sleepy but over excited girlies who met at 4am at Stansted- we were all just so excited to get there. I wanted this hen to be classy but still so fun, and it was just the dream! At 11am we arrived to our beautiful hotel ‘The Barcelo Marbella’. This was perfect for a hen. It’s defiantly more of a chilled vibe with lots of families there too, but I honestly thought it was perfect for what we wanted. The rooms and pool area were stunning and we spent the afternoon sunning ourselves, relaxing with cocktails, and catching up around the pool with ice creams. In my opinion it was better to have this chilled girly time rather than exhausting ourselves and jumping straight into a beach party. It meant we were SO up for the rest of the weekend. Right, now for the fun part…are you ready… let’s jump straight in…. Okay let’s kick things off by beginning with one of the best nights out I have ever experience.. Mosh Fun Kitchen. 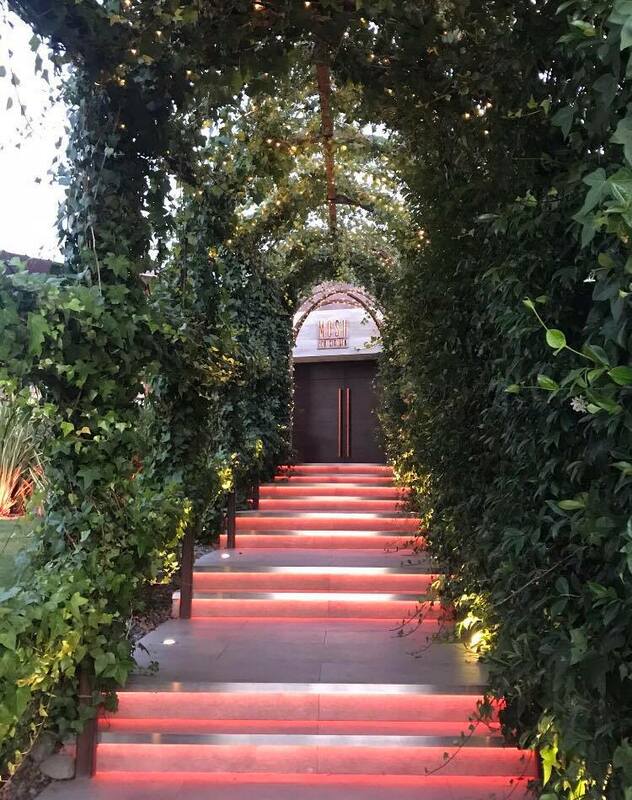 Mosh is one of those places that you see on Instagram and can’t quite believe that somewhere so cool, exciting and instagrammable actually exists- but it does- and it’s tucked away from the main strip so it feels a bit like one of Marbs best kept secrets. Mosh fun kitchen is essentially a steak/sushi restaurant that turns into a full blown nightclub. It attracts the most amazing cool crowd who all go for one reason- to have the best time. If you want a quiet dinner, this isn’t the place for you- instead you will be eating your dinner whilst a DJ pumps out some amazing tunes. You can sit outside on the terrace for a quieter dinner but I personally think the atmosphere inside was amazing. Around midnight something incredible happens- and within a second it seems like everyone at the restaurant stops eating and starts to party. 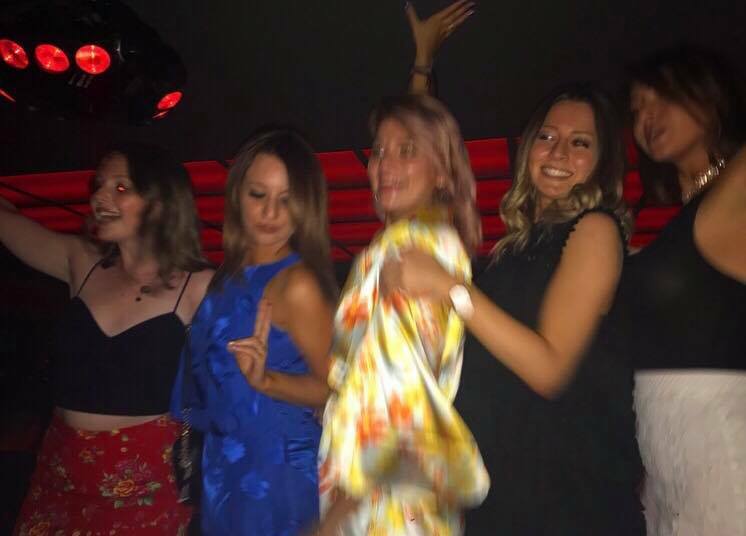 One minute I was at the bar, the next second our girl group were being lifted up by the fit waiters and being told we could dance on the tables. And let’s be honest, we didn’t get down from that table all night! We danced our hearts out and all agreed it was one of the best nights we have ever had. And let’s not forget to mention that staircase of dreams – an instagrammers heaven! Walking into Mosh alone is an experience. Mosh you were 10/10 and I can’t wait to come back for more. #Moshmademedoit. The next night we were in the mood for a chilled dinner, so we went to La Sala and sat on the outside terrace. I absolutely loved this night. The comparison between the two restaurants is crazy but I’m so pleased we got to experience both. The setting of La Sala is beautiful. We sat on the decking which was adorned with fairy lights and it felt really special. We spent the night gossiping and laughing at all the memories we had made that weekend. Inside there was live music and more of a party atmosphere but we needed a quieter night after our crazy day at Ocean Beach (more on that soon). So for us the terrace was the perfect place. The food was delicious and the service was brilliant. La Sala is also in a prime position for all of the night clubs so I would highly recommend to go with your girls before a big night out. La Sala I hope to see you again very soon! 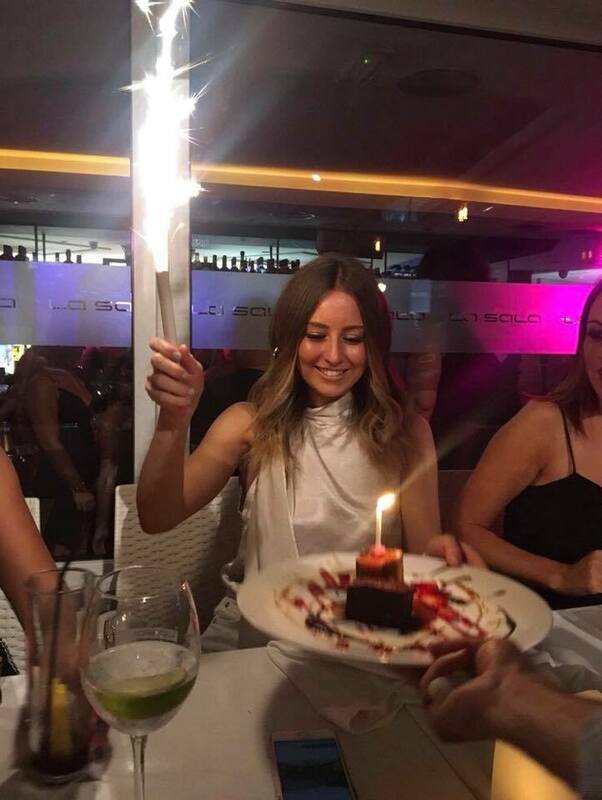 Whilst I didn’t get the chance to visit, the below places are all highly popular in Marbs..
Picasso’s– it’s a classic and everyone should visit this fun, buzzy family Italian on the edge of the strip for a chilled dinner- if not for the ice-cream alone. Oak Garden grill- the sister restaurant to La Sala which looks like a very posh steak restaurant. It actually looks ideal for a date night. Rachel’s– I recently stumbled across this cafe and it looks so adorable. It’s situated on the beach and serves healthy food in the most divine instagrammable setting. Ocean beach– I mean of COURSE we went to Ocean! Now this was my first ever experience at a beach club at Marbs and I can honestly say I had the best day ever. When sorting out the hen it was actually really hard to choose which day club to go too because they all had their own brill qualities. But I really am so pleased we went to Ocean! There were 15 of us, and we got two big round white beds next to each other. We paid for the second line and I think this was the best position as it was in the middle of everything, but to be honest I don’t think you can go wrong with any of the bed positions. 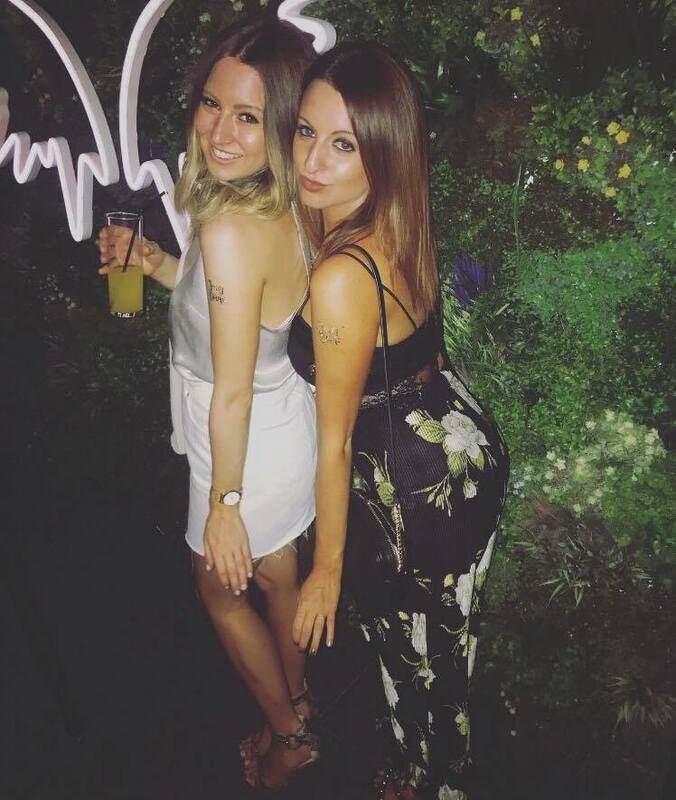 We spent the whole afternoon sunning ourselves, dancing, drinking cocktails and living our best life’s. The atmosphere was incredible (it was during the World Cup) and I didn’t want the day to end. And let me tell you- ocean Beach pizza is the ONE! Yes I was that girl! Alllll the carbs in Marbs!!! I really do think Ocean Beach is 100 percent the best place to go if you’re on a hen everyone there is in big crowds and it has the perfect party atmosphere! Other amazing clubs.. for next time…. Nikki Beach– Nikki beach looks so beaut. It does seem a tiny bit more chilled than Ocean but still with a great atmosphere and I really hope to visit soon. NAO– omg Nao looks the DREAM. 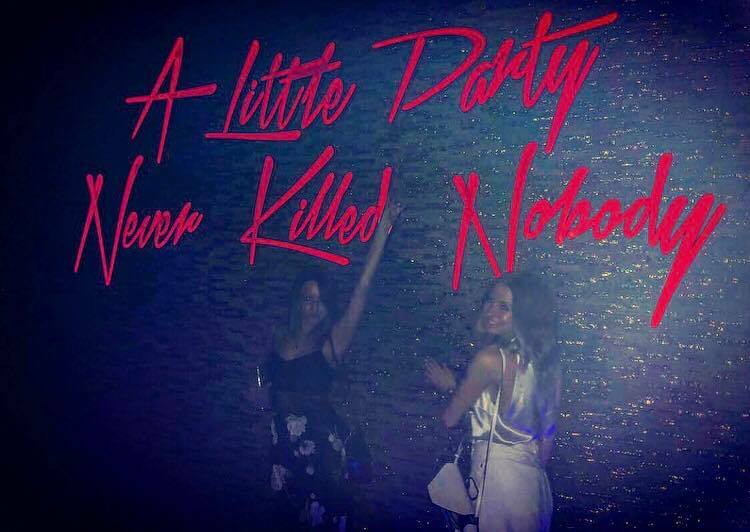 It’s a brand new pool club and gives off serious Vegas vibes. I also think this is more of a classy venue and looks like it makes for great people watching. Plaza beach– Plaza beach looks crayyy! You can book your own hot tub on the beach; I mean how amazing is that! This club also looks idea for big hen groups who are looking for a wild day out. Sisu– I’ve heard unreal things about Sisu. It’s a club in a hotel just off the strip and they have insane DJS performing there. 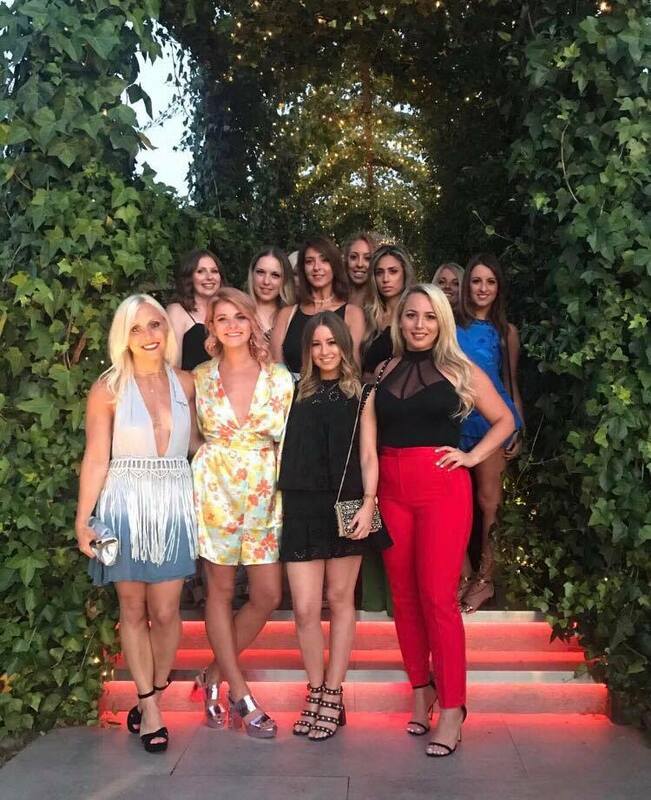 Mahiki Beach– Mahiki Beach is a more peaceful beach club and looks perfect for a chilled day with the girls where you can eat delicious food and relax on the beach. This seems like the perfect Sunday afternoon spot. 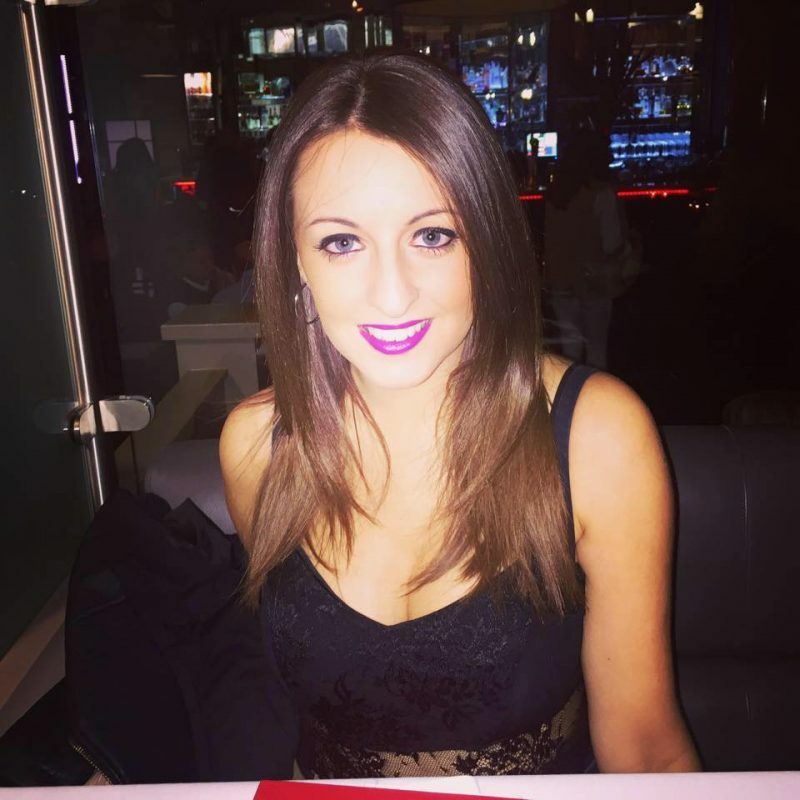 Let’s go OUT OUT- Marbs best night clubs! Pangea– Pangea is one of the most popular night clubs in Marbs. Whilst not being the cheapest of clubs if you’re willing to splash the cash for one night out this is the place to go. It’s an open air night club on a rooftop where all of the tables are outside. Go for the views alone- all you will see are stars and million dollar yachts ha! You do feel like a movie star when you come to Pangea and everyone should experience it at least once in their lifetime. News cafe- this is the best place to go for predrinks. The club has four levels and us girlies got a table on the rooftop where the views were so amazing. The music is unreal and to be honest you could easily spend the whole night here if you wanted. And this club has the best photo spots. It’s a bloggers heaven! I have also heard unreal things about Mirage, Tibu and Aqwa Mist. Wow so there we have it, if your still here reading this then thank you! I hope this is helpful to all you girlies who are about to plan a hen in Marbs. I promise your have the BEST time ever- I just want to rewind and do the weekend all over again. Please let me know if this guide is helpful in the comments below. A Spanish adventure awaits with Clickstay! Next Post My Fairy Tale Wedding Day!